I just realized that I have 2 control towers, which file should I disable or why I have this problem please? It looks like you used another FMEE scenery before installing FSDG-Reunion. Could that be the case? We excluded all objects that are listed "below" in the scenery library, maybe there's another addon listed above? Please also make sure to disable static jetways in the config tool if you use SODE or generic animated jetways. yes, I used another scenery but without installer, I just chose the directory "scenery" in the library. Now it is disabled, there should not be any active files. No installer? There were probably some files that were copied into another active scenery folder. ok thanks, can not find these files. The only solution would be to reinstall everything properly. I prefer for now to leave the 2 towers. MOISE wrote: ok thanks, can not find these files. The only solution would be to reinstall everything properly. I prefer for now to leave the 2 towers. In the original FSDG-Reunion has a fault: The default control Tower is included in the AFD. You can not imagine how you helped me. I had other important problem with this scene that are now resolved, such as AI planes that did not take off, it remained stuck at the stop just in front of the track. when you want more help for AI, visit the Alpha India Group (Freeware AI Enthusiast Group). No matter how I tweak it and close off runways etc in ADE I just cant get this real world runway flow to work. Also I need to find a way for AI GA traffic coming from the GA terminal to not run in to each other while on the taxiways Landing GA traffic seem to always want to find the same taxiway back to the GA terminal as the departing traffic use for finding their way to the runway. I guess default P3D ATC staff is not very smart people I can never get taxiway F and G to be used effectively at the same time. Those findings correspond with my experience. 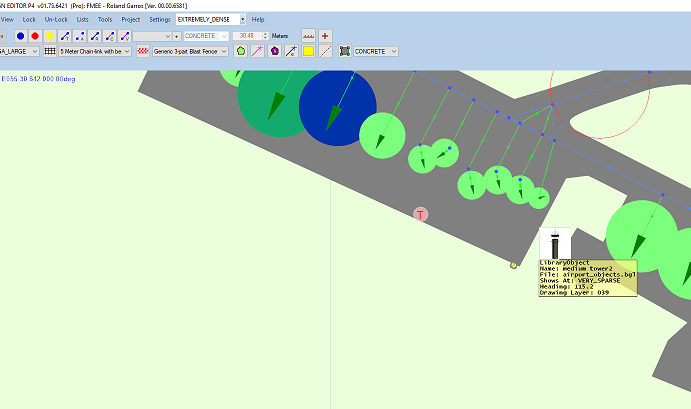 There are only very limited options to control runway and taxiway assignments. Sometimes it's possible to use some tricks to try to force AI aircraft to follow certain paths but in the end there is one major rule in FSX & P3D: Always use the shortest path between parking and active runway. Like ants AI aircraft will do anything to obey that rule. We still hope P3D will soon come up with a major AI improvement as the code that is in use to this day is mostly from the good old FS2002 days - almost 20 years old! Make sure you disable static jetways in the Config Tool. EDIT: All gates at FMEE should have 2 jetways. Well there is a "Docking Jetways" checkbox and I have that unchecked already. I dont have a static jetways checkbox though far as I can see. Is there a bgl in the scenery folder that I can deactivate to get the same result perhaps? Sorry, my bad. At FMEE we tested default jetway animations which didn't really pay off since almost nobody used them. The choice in the tool is between static and default animated jetways. If you use SODE jetways you need to disable the bel manually. It's described in the FMEE SODE link readme.